Margaret Barker contributes a characteristically Christian voice to contemporary theological debates on the environment. Most of the issues we face today were not those that faced the early Christian community and so there are often no directly relevant biblical teachings. Barker's starting point is the question of what Jesus himself would have believed about the Creation? What could the early Church have believed about the Creation? She then shows how much of this belief is embedded, often unrecognized, in the New Testament and early Christian texts. It was what people assumed as the norm, the world view within which they lived and expressed their faith. Barker deals with such arguments as, 'But the New Testament says nothing about this', and establishes the general principles of a Christian view of Creation. Starting with how the Bible was understood by early Christians, Barker looks briefly at the history of a text or symbol, before examining what later Christian teachers did with that text or symbol. The idea that Adam was the steward of the creation, for example, is entirely unbiblical, and was imported into the text with disastrous results.Some of what she says will show how current teaching would have been unfamiliar to the first Christians, not just in application but in basic principles. Creation by Margaret Barker was published by Continuum in November 2009 and is our 36515th best seller. 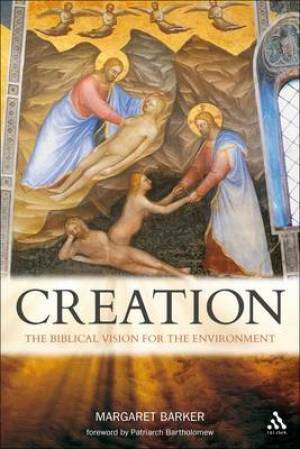 The ISBN for Creation is 9780567015471. Be the first to review Creation! Got a question? No problem! Just click here to ask us about Creation.